Well, Tuesday proved to be another eventful day in the life of our CHD Superhero. Usually, when we tell doctors that we “live in the 1%”, we mean that if something can only go wrong 1% of the time, then it will happen for Reiss. However, this time was different and the news was amazing, to say the least. Tuesday started with the usual trip to the Heart Center at Texas Children’s Hospital for pre-op appointments. Reiss went through all the tests: height, weight, EKG, echo, labs, etc. We then talked to almost everyone on her team from social work to anesthesiologists. Our last visit was from Tammy, our Nurse Practitioner. The tricuspid regurgitation, which was listed as “moderate to severe”, was now just moderate. That is amazing! The leaflets were thickened. (Later, McKenzie mentioned this was very mild). She was confident Dr McKenzie would be able to repair the valve with these complications, versus replacing the valve. We left our meeting with Tammy still thinking Reiss would have surgery on Wednesday morning. Dr McKenzie was still in the operating room, so we killed time before consulting with him. When we finally met with him, he said he was “on the fence” about even doing the surgery. This was not the plan I had a set of questions prepared about valves, heart transplants and new pacemaker leads. I was caught off-guard and ended up calling Roy to put him on speaker-phone to help keep the conversation going. Here is the reasoning McKenzie went through in regards to surgery. Her regurgitation had improved. McKenzie had forecasted it would deteriorate further by now. Her right ventricle (RV) dysfunction was listed as “mild to normal”, which hadn’t changed. This means, her regurgitation decreased, adding more work to the RV, and the RV reacted by continuing to squeeze as it should. The surgery is a major surgery that will be hard on Reiss. If she is doing well, no need to go through the surgery. If he knew 100% that she needed a valve replacement, he would choose to wait. If he knew 100% that the valve was repairable and the ventricle would react well, he would go ahead and replace it to be safe. However, there is no way to be 100% confident on either of those. By the end of the conversation, Dr Mckenzie suggested to not go through with the surgery. He wanted to monitor her frequently, and mentioned she could even continue to do well like this for years! We will follow-up every 3 months, starting locally, with an X-ray and echo. During these visits, we will look to make sure the regurgitation doesn’t get worse and that her heart doesn’t get larger from fluid retention. Her activity level will also be reviewed to make sure moderate activity isn’t taxing on her. Dr Mckenzie believes her body will give us enough warning to know if she is regressing as long as we review her status every 3 months. Living in the 1% has not felt so good as it did on Tuesday. Thank you for you prayers throughout the process. We were not banking on a miracle this week, but we’re blessed with one anyway. Reiss, Mama Gay, Mama Cindy and myself are in Houston, Texas now. We arrived on Saturday, gave blood on Sunday, and are now killing time until Reiss’ pre-op appointments on Tuesday morning. Starting at 8am on tomorrow morning, Reiss will get the following done: blood pressure, temperature, pulse reading, height, weight, pulse ox, x-ray, echo, and lab draws. We will also visit with the EP team, anesthesia, her cardiologist and surgeon. Sometime during the day, the team will give us our instructions on when surgery will be on Wednesday. Please pray that Reiss can stay well from now, through surgery, on our way home, and throughout her 6 weeks of quarantine post-surgery. 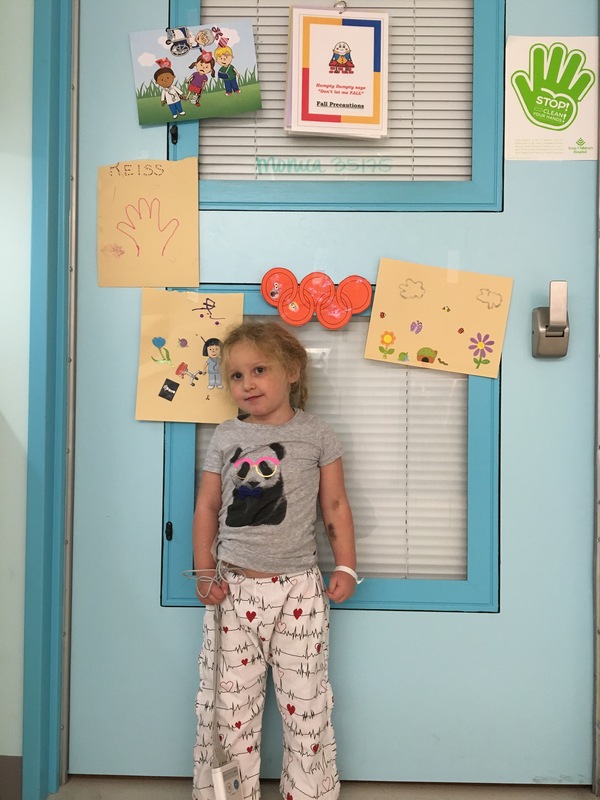 We also pray that Dr. McKenzie is able to repair her valve (instead of having to replace), and that her right ventricle responds positively with the squeeze her body needs to continue. I sat down tonight to write a blog piece. My fingers unconfidently tapped at the keyboard multiple times, only to end up deleting the text over and over again. To tell you the truth, our complex combination of life events left my mind cloudy tonight, laying a fog over the thoughts of my heart. With my face in my hands, I closed my eyes, took a breath, and asked myself, “What is it that you want people to know? What are you trying to say? What are the major takeaways?” I know, I sound like I just finished the latest class from a slew of leadership seminars (which, I kind of did), but stick with me. My mind wandered to elementary school. It’s the first grade and Mrs. Fuson is discussing careers. We are all to think about what we want to be when we grow up, write about it, and draw a picture. I chose to write about being a teacher – just like my daddy. I giggled a bit, remembering my short stint as a student teacher. To make a long story short, I was just plain not good at teaching. Fast forward to junior high. Let’s face it, this is the most awkward time of a person’s young life, in my opinion. I was learning so much, some about school, some about boys, some I was supposed to know, and some I knew I should have stayed away from (but didn’t). I don’t remember thinking about my future during these crazy two years. My priorities included: boys, friends, sometimes family, school, and basketball. I was reminded this past weekend of my love for basketball as Coach Milleson was inducted into the Drury Athletics Hall of Fame for her amazing years as a Lady Panther. I was/am so proud to be a Lady Panther. At the end of my college career, I looked back on all that basketball had given me. From the beginning (around first grade), basketball made me tough, provided an outlet, brought my family together, gave me the ability to travel all over the United States, left me with a whole host of life-long friends, and countless other opportunities. Basketball was the anchor and best part of my life for upwards of 15 years. The fog lifts and I see it. With each passing year, the “best” part of my life has morphed into something new – and that is okay. New experiences, new knowledge, new places and people. All have impacted my life immensely. It would be easy – and I would be lying by saying such thoughts have never crossed my mind – for one to sit and think about what could have been. Did I do something wrong to get where I am today, or something right? Erring on the negative side is a slippery slope into a dark world in which no one wants to reside. You’ll start to disregard the blessings in your life and focus only on things you don’t have. This is my place. I have a loving, supportive husband, with which I have shared some of the best and worst experiences. Together, we created maybe the funniest person in the world – Reiss “don’t-call-her-a-baby-anymore” MaeLene. Our families live close and help us in any way possible through any adversity we face. We have formed bonds with co-workers and communities through a variety of events and made connections with numerous heart families, as well as families experiencing other defects and diseases in their children. Where basketball once assisted, adversity has now stepped in. It is through adversity we have found ourselves and experienced new opportunities. 35 years of experiences have taught me to be strong, face adversity, use reflection as a learning tool, allow others to help, be open-minded to other opinions, look for opportunities to pay it forward, to listen, know when to fight and when to chalk it up as a loss, how to laugh even in the toughest situation, and when to love without ending. Thank you to all of you who have wished me happy birthday. It is the best birthday yet, as it is exactly where I am supposed to be. I look forward to the new opportunities life shows along the way. After our appointment on Friday with the cardiologist, we talked with our surgeon, Dr. McKenzie (Dr. M), and his Nurse Practitioner (NP), Kelly. Reiss’ issue of heart failure is centered around her tricuspid valve’s regurgitation (TR) and her left-sided, right ventricle’s dysfunction. Before we get started with what that discussion entailed, I believe it is important to give you a picture of Reiss’ heart – see picture below. On the left is a normal heart. On the right, it shows how the tricuspid valve and right ventricle both sit on the left side of the body. In Reiss’ heart, however, the ventricular septum has two patches in it from the closing of her VSDs, and her PA (pulmonary artery, which pumps to the lungs) was ligated and replaced with a conduit with its own valve. Also, Reiss’ heart is positioned in her body more towards the center of her chest instead of on the left side, as well as turned slightly. Dr. M mentioned that he was puzzled about her mild to severe TR just within two months of open heart surgery. When we were admitted, he asked that we get a cath to look at the pressures in the heart. He thought that her TR and ventricular dysfunction may have to do with the pressure in the left ventricle (LV). If the pressure in the LV was low, then the ventricular septum would bow towards the LV, pulling apart the tricuspid valve (TV). The fix for this low pressure would be to have an additional open heart surgery to decrease the size of the conduit going from the LV to the PA. However, this was not the case. In fact, after cath results were in, they saw that the pressures in her LV were almost perfect. Another guess on why Reiss has TR and right ventricular dysfunction is that her pacemaker is inducing cardiomyopathy. The echo Reiss had in the cath lab does not confirm this, though. Additionally, multiple electrophysiologists (EP) discussed her case and reviewed her data, finding no hint at ventricular dissyncrony. At this point, they just plain don’t know why. They do know that TR is a sign that the ventricle isn’t happy, but they don’t know why the ventricle isn’t functioning properly. Everything else in her heart looks good – pressures, conduit, VSDs are closed, LV is happy, branch pulmonary arteries are good. They don’t see a quick or easy solution. She is currently on lasix and enalapril to reduce fluid build-up and increase heart function and they seem to be working. However, her TR is listed as “moderate to severe” and this is not durable over time. They sent us home on Friday and told us to see our local cardiologist this week, as well as schedule a follow-up in Texas a month from now to check on the TR. What do we do if the TR is better? Nothing. We continue with the medicines we are on, go to follow-up appointments locally and in Texas, and keep watching for signs of heart failure. What do we do if the TR is worse? Surgery. We will schedule a surgery date two months from now in case we need it after our follow-up in a month in Texas. Tricuspid valve repair | The ring around the tricuspid valve is called an annulus. Reiss’ annulus is currently dilated. This repair – an annulaplasty – would be to decrease the size of the annulus, allowing the leaflets of the tricuspid valve to touch and close properly. The team would use a cloth ring that would grow with her probably into her teenage years. They aren’t sure if the tricuspid or the ventricle is the issue. If they fix the tricuspid, but the RV still isn’t functioning properly, then they have just had an open heart surgery to repair something that didn’t fix the problem. They are pleased (at this point) that her RV dysfunction is tagged as “mild”, which may mean TR repair could work. Bi-ventricular pacing | A controversial option, according to Dr. M, for her pacemaker is to place a lead on both ventricles so that an electrical current is sent to both ventricles at the same time, allowing them to push against each other to provide support in the pumping function of the heart. The team in general does not usually have an additional surgery on a child just to place these types of leads – there is controversy over if this is beneficial, as well as if the trauma from an open heart surgery is warranted solely to place these leads. Because of this, they would most likely only do this option if they were already planning on the tricuspid valve repair mentioned above. Reiss would also get a new pacemaker that had a port for this extra lead. So, we will wait. Wait until Monday to schedule appointments. Wait to see what her echo and EKG looks like this week. Wait to go back to Texas in a month for a follow-up. Wait to see if she has more symptoms of heart failure. We are on our way home now. They would like to see if her tricuspid regurgitation and ventricular dysfunction gets better over time. We will follow-up with our local cardiologist this week and come back to Houston in a month. More details to follow. Dr McKenzie came in and said he wanted a Cath to know the pressures in Reiss’ heart. An issue could be that the left ventricle’s pressure is too low, which is pulling the ventricular Septum and the baffle they use to close her VSDs towards it, thus pulling the tricuspid valve, causing the regurgitation. If that IS the case, we will need open heart surgery to put in a smaller conduit, which will increase the pressure in the left ventricle and hopefully help the regurgitation. If that IS NOT the case, then they don’t really know what the issue is. One option is the additional lead placed on her ventricles (synchronization therapy), which we have mentioned before in previous blog posts. But by the way he talked, it sounded like we needed some sort of surgical intervention before we go back home. We don’t know when we will have a Cath – depends on schedules this week. So, now we are waiting on a Cath schedule, and the results from that Cath to know where we go from here. After I wrote my previous post, I noticed that I didn’t exactly explain Reiss’ diagnosis. Here is a short list of items they found. Severe right ventricle dysfunction – meaning her right ventricle isn’t squeezing properly. Moderate to severe leakage of her tricuspid valve. Her heart was swollen because it had to work so hard. Moreover, they found fluid around her heart, adding to the pressure on her heart. As mentioned , the goal is to use medicine to help her heart function properly. Why did this happen? We knew that right heart failure was a possibility given this type of surgery. The fact is – her right ventricle was designed to push the lungs, not the body. The amount of work needed to constantly push to the body would eventually fatigue the chamber and cause heart failure. We thought this would happen in her teens, 20’s, or even 30’s – not 2 months after surgery. It is unfortunate, but it is the hand that has been dealt. We will continue with trying a medicinal approach to treating her condition. We got to Houston around 1:30am on Thursday morning and went straight to the ER to be admitted for symptoms of heart failure. Most of Thursday was spent talking about the changes we saw in Reiss that made us concerned and the steps we took to get to Texas. By about 8:00am, we were escorted up to the 15th Floor. Half of this floor is part of the Cardiovascular Intensive Care Unit (CVICU) and half is the Step-Down Unit patients visit prior to going home. We have been here before. In fact, we walked right past the room we had in early June. A wave of memories flooded our minds: taking her test tube out, learning to walk post-surgery, and thoughts of what the future will hold. This time, however, we walked through a secondary set of doors – the doors that separate the CVICU from the Step-Down Unit. I swallowed the lump in my throat as I read the words above the doors – “HEART FAILURE INTENSIVE CARE UNIT.” Then I looked at Roy. He read it too, and, by the look in his eyes, I knew he felt what I was feeling – scared and anxious. Two months ago, we were looking at the future. It was bright and big and unending. After learning that she was in heart failure, however, our thoughts of the future made a complete 180. The bright future was now overshadowed by doubt and what was once unending was now viewed as finite. Our thoughts went straight to the worst – her heart is failing and she will need a new heart. How long do you wait for a heart? What happens if it doesn’t take? All of these worst case scenario questions were running rapidly through our heads. Lasix – Reiss started on Lasix on Thursday and continues to be on them to help get fluid off of her heart and out of her blood (so she doesn’t have to pump so much volume through her heart). They will keep her on this regimen until they reassess on Monday. They may wean her down from an IV dose to an oral dose sometime next week, but she will always be on this med even when we go home. So far, it is already working. Her heart rate and number of respirations have decreased. Her fatigue seemed to get better today, so we are happy about that as well. Her appetite is still down and it is a struggle to get her to eat and drink. She has lost about 2.5 lbs in 3 days and we are worried that if she doesn’t keep at least drinking, that she will become dehydrated and have to be on IV fluids. Ace Inhibitor – this helps decrease blood pressure in her arteries, as well as increase heart function. While the lasix may decrease the workload on the heart, it won’t help the ventricle squeeze as it should. The ace inhibitor could help it squeeze. She had her first dose of this today. We are to watch to see if her fatigue increases over the next couple of days. If it increases, they will attribute it to low blood pressure and have to adjust this medicine. Repairing the tricuspid valve – this was mentioned briefly as an option. However, even if the valve is working properly, if the right ventricle isn’t squeezing as it should, then you are no better off. Additionally, a repair of the tricuspid valve isn’t a successful surgery to begin with. Adding another lead to her pacemaker – this lead would be placed on each ventricle and would pulse at the same time to help the ventricles pump together instead of working against each other. Heart Transplant – the team hasn’t talked about this one yet, but has mentioned they thought they had “a lot of room to move” with medicines before a surgical approach was needed. We don’t really know. We talked to our surgeon’s NP, Tammy, and she thought we could be here for 2 weeks as we try to figure out a good mix of medicines and if surgery is necessary. If surgery is necessary, it will be longer than 2 weeks. If a heart transplant is necessary, we could be here for months, depending on when a donor heart becomes available. We are just waiting around to see if the medications are positively affecting her condition. X-rays are completed daily and blood work is on Mondays and Thursdays. 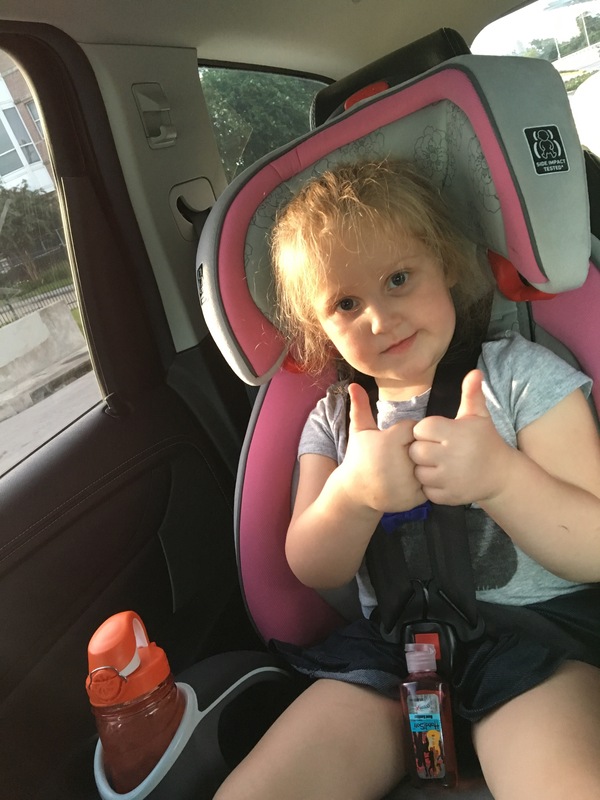 She will get an echo as needed to see how far she has come since her admission, but most importantly, they are watching her to see if her respirations, fatigue, energy, appetite and general attitude improves or regresses. Reiss visits the playroom, which keeps her attention for a bit. We also watch movies, color, and go on walks around the unit. as part of the Texas Childrens Olympic Games opening ceremony. She was very serious about carrying the torch and was worn out after. Thank you for the continued prayers as we go through this uncertain time.